Episode #374 Part III: Superman Comic Book Cover Dated October 1964: Action Comics #317! Action Comics 317, October 1964! Download Episode 374 Part III! ACTION COMICS 317, October 1964, was published around August 27, 1964 (which was my parents' fifth anniversary). It contained 32 pages for the cover price of 12¢. The editor was Mort Weisinger, and the cover was pencilled by Curt Swan, inked by George Klein and lettered by Ira Schnapp. 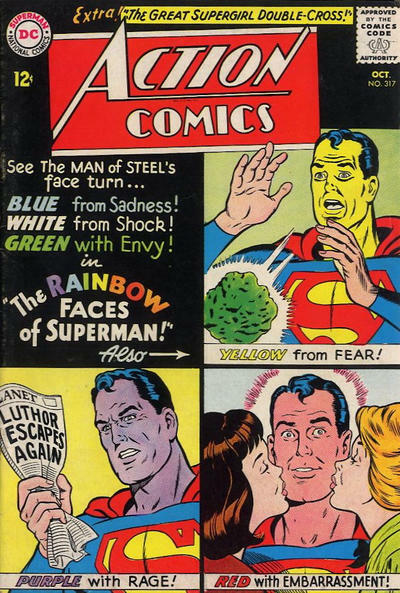 It featured the Superman story in this issue. - (14:32) SUPERMAN'S RAINBOW FACE (11 pgs. ), written by Otto Binder and drawn by Al Plastino. - (33:26) METROPOLIS MAILBAG letter column. - (41:43) THE GREAT SUPERGIRL DOUBLE-CROSS (12 pgs. ), written by Leo Dorfman, drawn by Jim Mooney and lettered by Joe Letterese. This story was reprinted in SUPERMAN FAMILY 166, August/September 1974, published on May 28, 1974. It contained 100 pages for the cover price of 60¢. This story was also reprinted in SHOWCASE PRESENTS: SUPERGIRL vol.. II. Also highlighted in this episode are the issue's ads and other features. The episode begins with the MY PULL LIST segment, featuring the comic books cover dated February 2018, which were released during the month of November 2017. I received them from Discount Comic Book Service. Next Episode:SUPERMAN FAMILY COMIC BOOK COVER DATED OCTOBER 1964 PART IV: SUPERMAN'S PAL JIMMY OLSEN 80! At the end of this episode the ELSEWHERE IN DC COMICS segment will explore the other DC titles which carried the October or October/November 1964 cover date. In the following episode: SUPERMAN 2017: THE YEAR IN REVIEW! Then we will return to our regularly scheduled silver age comic book schedule with: SUPERMAN FAMILY COMIC BOOKS COVER DATED NOVEMBER 1964: PART I: WORLD'S FINEST COMICS 145, PART II: SUPERMAN 173 & PART IV: SUPERMAN'S GIRL FRIEND LOIS LANE 53! 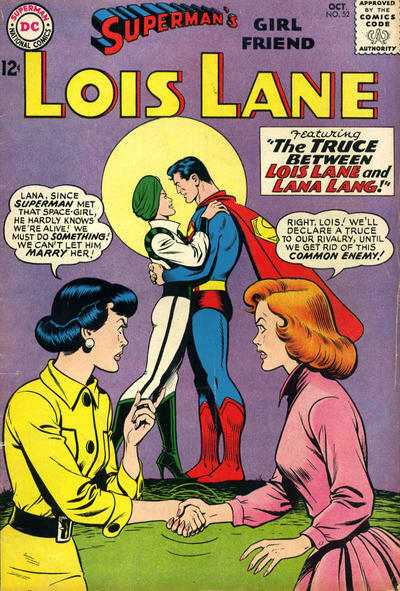 Episode #374 Part II: Superman Family Comic Book Cover Dated October 1964: Superman's Girl Friend Lois Lane #52! Superman's Girl Friend Lois Lane 52, October 1964! Download Episode 374 Part II! SUPERMAN'S GIRL FRIEND LOIS LANE 52, October 1964, was published around August 13, 1964. It contained 32 pages for the cover price of 12¢. The editor was Mort Weisinger, and the cover was drawn by Kurt Schaffenberger and lettered by Ira Schnapp. It featured the issue's third and final story. Schaffenberger was also the artist for all three eight page stories in this issue, writer(s) unknown. Also highlighted in this episode are the issue's ads and other features, including the LETTERS TO LOIS column. The episode begins with the MY PULL LIST segment. This time I review the comic books I received from Discount Comic Book Service, which carried the January 2018 cover date, and were published during the month of November 2017.